Chong (left) fields questions during the press conference. With him is Yii. KUCHING: Stampin MP Julian Tan Kok Ping will not be defending Stampin in the next parliamentary election. This was confirmed by Bandar Kuching MP Chong Chieng Jen, who said the one-term MP had informed the party of his intention. “Julian Tan will not be contesting in the next (parliamentary) election as he has decided to retire from politics and focus on a career in science and technology,” he said at a press conference yesterday when asked to comment on rumours that Tan would not stand as a candidate in this election. In the last parliamentary polls, Tan won with a majority of 18,670 votes – defeating long-term MP Datuk Yong Khoon Seng and Lina Soo of STAR. 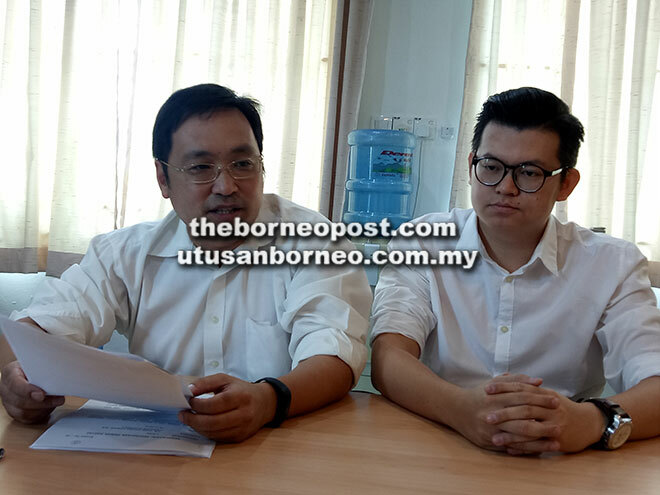 On a related matter, Chong said the seat negotiations among the three component parties of the opposition pact, Pakatan Harapan (PH), in Sarawak had long been settled. “We have settled this from as early as last year, so it is not an issue,” he said, adding that DAP would be contesting in the same number of seats as contested in the last parliamentary election. The last parliamentary election saw the state DAP winning five out of 11 seats it contested, whereas the state PKR lost in all 14 seats. PAS, which was then part of the state Pakatan Rakyat (PR), also lost all the five seats it contested. For the next parliamentary election, Chong – also PH Sarawak chairman – said the opposition coalition here would comprise DAP, PKR and Parti Amanah Negara (Amanah). “I speak on behalf of PH Sarawak that PAS is not part of us. They can come in for three-cornered fights during the election if they want to,” he said.